Have you heard of the Month of the Young Child? In April children, parents, and teachers focus on fun, creative ways to learn and grow. Join in with the 14th annual One Book, Every Young Child celebration, when libraries, child care centers, and early learning programs throughout Pennsylvania will share common books with children to promote the joy and benefits of reading. The One Book Every Young Child program was established by the Pennsylvania Department of Education Office of Commonwealth Libraries. It highlights the importance of early literacy development. Bucks County libraries will offer storytimes and programs that engage children and support their parents and caregivers in teaching early literacy skills. 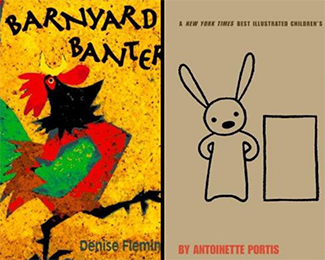 One of this year’s book selections is Denise Fleming’s Barnyard Banter. Children will enjoy its vibrant, textured illustrations and energetic text. They can follow an inquisitive white goose who flits through the pages and crow, cluck, and moo along with the animals as they explore a cheerful, noisy farm. The rhyming text is strong and simple, and the animal noises are familiar, which will encourage young readers to join in the fun. This year the One Book Every Young Child program has expanded to offer a common book for slightly older children as well – Not A Box by Antoinette Portis. This Theodor Seuss Geisel Honor Book is told in a question and answer format. “What are you doing on top of that box?” the narrator asks. “It’s not a box,” an engaging rabbit replies — and the reader sees the box transformed into a mountain peak! The drawings and dialog are minimal, and yet the book is a wonderful inspiration for children to make up their own adventures from everyday things. Saturday, April 6 at 10 a.m. at the Langhorne Branch. This family friendly event will include block building challenges, cardboard crafts, parachute play, and special guest State Representative Frank Farry reading Pennsylvania’s One Book, Every Young Child 2019 selection Not a Box at 10:30 a.m.! The first 20 families get a free copy, provided by the Bucks County Chapter of the Pennsylvania Association for the Education of Young Children. Saturday, April 6 at 10:30 a.m. State Representative Craig Staats will be the guest reader and he will have free copies of one of the Pennsylvania One Book selections for the first 20 families that arrive. Saturday, April 13 at 11 a.m. This special storytime for all ages will celebrate both books. Next Post: Love Libraries? These Books Are For You!